In this tutorial, we will learn how to use the AMBER programs to build a residue template and parameter set for a custom, modified amino acid. 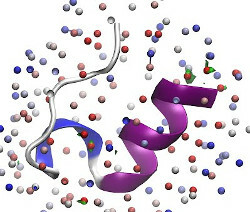 Unlike other tutorials that detail how to create a residue template and parameter set for a small organic ligand, the modified amino acid in this example must be bonded to the residues that come before and after it in the protein polymer sequence. As a result, the process is more complex and has more steps. Updated for Lipid14: Phospholipid bilayers are essential components to cellular membranes and are the stage where many essential biophysical and biochemical processes take place. This tutorial explains how to set up and simulate lipid bilayers with the Lipid14 force field. 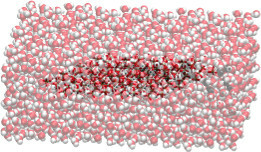 A DOPC bilayer is built, converted, and loaded into LEaP to assign parameters for molecular dynamics simulation. 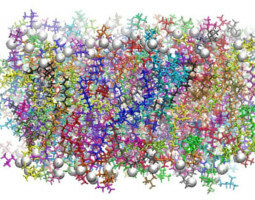 A molecular dynamics scheme is presented followed by analysis of the bilayer structural properties in the trajectory. 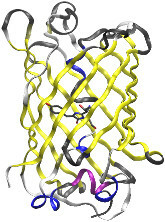 Furthermore, membrane-bound proteins are examined and a simple membrane-bound protein system is built. Parker de Waal has created an alternative lipid-building tutorial using Maestro. 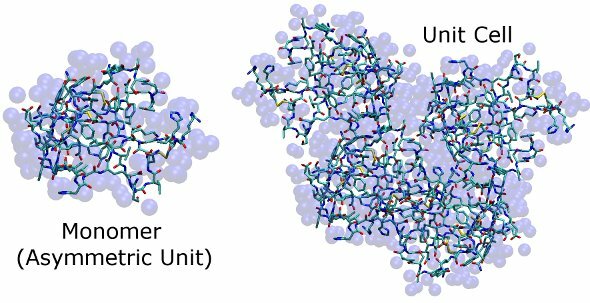 This tutorial describes one way to set up a simulation of a protein crystal, showing how to construct unit cells, and how to fill in missing solvent. This tutorial illustrates the use of antechamber and sander to carry out some simple simulations of a room-temperature (non-biological!) ionic liquid. Together with the INTERFACE force field, this tutorial explores the functions of employing the AMBER software package to modeling material and interfacial systems. 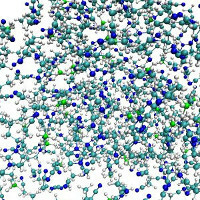 This tutorial shows how the 3D-RISM method can be used to generate an initial configuration of water around a solute molecule.